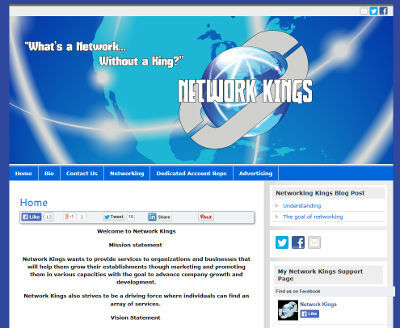 David, the CEO of My Network Kings, contacted us yesterday in need of some items to be fixed on his website. He said that his contact form wasn’t working and that he wanted a new picture of himself added to his Bio page. Along with that, he asked about any other recommendations we had. Upon looking at his site, we saw that he had a large graphic below the navigation area of his site – and a huge area of white space above it. Therefore, we recommended to have that graphic moved above the navigation area, which he approved. We completed the work very late last night to ensure that it was done in a timely fashion for him, and he was very thankful of our attention to it. However, he still continued to have problems with his contact form – he was not receiving the e-mails. We tested the contact form and everything was working fine with it when the messages were sent to our e-mail account, but he still wouldn’t receive any messages sent to his account. He called GoDaddy – his hosting proivder – and they told him it was his website and nothing with their service. Unfortunately, this was not the case, because the messages were being sent from his website to us successfully – just not to his account. Fed up, David decided to have us host and manage his website. Upon getting the order, we worked very quickly to make a backup of his website at GoDaddy, copied it over to our systems, and transferred the domain name over to us for management. His two e-mail accounts were then setup as well. Upon completing the move, we tested his contact form again. What do you know? He got the e-mail right away! That shows that it was indeed a problem with his e-mail or website hosting at GoDaddy and the problem was resolved upon transferring to us. We appreciate the business from David and look forward to a long relationship with him. David’s website is at mynetworkkings.com.